Dacorum Borough Council held a ground-breaking event to mark the preparation of work starting on a housing development in Apsley, demonstrating another exciting milestone in the council’s commitment to deliver new affordable homes for Dacorum. Magenta Court, in Stationers Place, next to the old Apsley Paper Mill building will provide 29 one- and two-bed flats within four blocks, all for social rent. The scheme of modern and energy-efficient new homes will provide much much-needed affordable homes for Dacorum residents. The contractor is Jarvis Contracting, who recently delivered the successful Kylna Court development in Maylands. 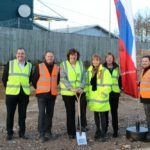 The ground-breaking event was held on Thursday 7th February and was attended by Cllr Margaret Griffiths, council representatives and Jarvis Contractor’s CEO Mark Doyle and his construction team. Another ground-breaking event is also taking place at the former Martindale School housing development site, which will provide 65 new homes, including 44 for social rent. The Council is committed to a successful building programme that will provide a legacy of homes that are attractive, useable, durable, and that will contribute to local communities and the environment. Pictured above from left to right are: Andy Moulding, DBC’s Employers Agent from John Lester Partnership, Jason Tucker from Jarvis, Cllr Margaret Griffiths, Fiona Williamson and Jo Deacon from Dacorum Borough Council and Mark Doyle at Jarvis.